Spanish luxury brand Loewe has launched five new fragrances in their Colección Un Paseo por Madrid: Mayrit, Tertulia En La Plaza Mayor, Descubriendo A Colón, Primavera En El Mercado De San Miguel and Tardes De Domingo En El Hipódromo. Mayrit (above left) ~ "Loewe presents Mayrit, a mysterious Eau de Parfum, exclusively available at Harrods. Mayrit takes us to the Arabic days of Madrid. A heroic and strategic fortress that was tirelessly defended by its robust walls against the enemy. Infused with refreshing notes of orange blossom, jasmine and amber, this opulent fragrance represents the tenacious, perservering and enigmatic city." £200. Tertulia En La Plaza Mayor (second from left) ~ "Every window of every building on the Plaza Mayor in the historic downtown Madrid can be sensed in this luxury fragrance from Loewe. Notes of black pepper, rose water, orange blossom and sandalwood echoes of past and future conversations, creating a totally immersive olfactory experience." £136. Descubriendo A Colón (second from right) ~ "As the statue of Columbus points to the New World, Descubriendo a Colón from Loewe transports us to unknown destinations, whisked away to unfamiliar passions. Indulgent and intriguing, the richness of oud blends with nutmeg and pepper berries, while tonka beans seal the fragrance with a touch of musk, leaving an indelible mark with invigorating, long lasting qualities." £136. Primavera En El Mercado De San Miguel (above right) ~ "Just like its namesake in Madrid, Primavera en el Mercado de San Miguel from Loewe is an explosion of sensations and colours that merge under a marvellous iron structure. A favourite spot for Madrilenians and tourists alike, this inspired the exhilarating fragrance, with aromas of bergamot, pear and patchouli wrapping the Eau de Parfum in a refreshing sensory experience." £139. Tardes De Domingo En El Hipódromo (not shown) ~ "Inspired by Tardes de domingo en el Hipódromo’s emblematic scenery where Madrid's aristocracy and high class gathered, this luxury fragrance from Loewe infuses notes of Jasmine, leather and vanilla for an alluring woody floral scent." £139. 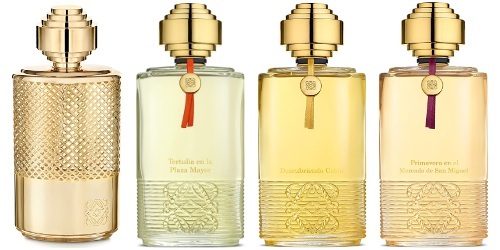 Loewe Mayrit, Tertulia En La Plaza Mayor, Descubriendo A Colón, Primavera En El Mercado De San Miguel and Tardes De Domingo En El Hipódromo can be found now at Harrods in the UK, in 100 ml Eau de Parfum. I am in loooooove with those bottles! !There has been some spectacular bottles this year,but these are gorgeous.I hope the juice match in beauty. The ones to the right, that’s the packaging for the whole collection, which started in 2013. The one on the left appears to be a one-off, but it’s my favorite. Seems only fair for it to be fancier for Mayrit, since the perfume is more expensive than the rest of the line. I wonder if it’s metal at the bottom and could be engraved. Aargh! “I thought”, not it thought! Ha! Was confused but after a minute I do see just what you mean!